Hola! Yo me llamo Amy. Como te llamas? Yes, we are learning Spanish and enjoying it. 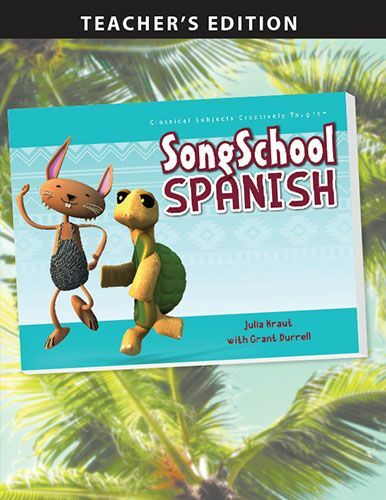 We reviewed Song School Spanish from Classical Academic Press. I have seen the Latin version for a number of years and always had it on my list but when we saw the Spanish version George especially asked if we could learn. Anytime a child wants to learn that makes it all the better. 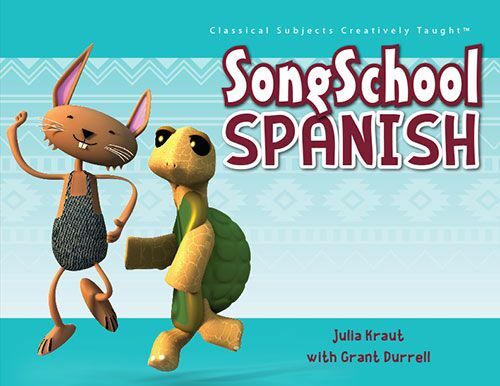 Song School Spanish is a "gentle and engaging introduction to Spanish". It is geared for Kindergarten through third grade with 30 weekly lessons. Each chapter consists of new words to learn that are part of our every day life. There are songs to listen to that reinforce the new words, practice writing of the words, and a review of what you have learned. While it is geared to K - 3rd grade we all used Song School Spanish, even George (13) and I enjoyed it. We went through one chapter per week which is what is recommended and that worked well for Tank, Missy, and Seppy (my K - 3rd kids). I introduced each new word or phrase for the chapter by playing the pronunciation guide that you are able to download from the Classical Academic Press Song Spanish page. I was very thankful for that or we would be learning an entirely different language! We then listened to the songs that correlated. The next time we would review and practice writing along with listening to the songs. Listening to the CD wherever you go is recommended and while I wondered if that might get old I found the songs to be very entertaining and catchy and while geared for children my teenager had fun with it too. Now I wake up in the middle of the night singing songs in Spanish and wanting to clap along. What a great way to learn! And the games and activities are also a nice way to reinforce what was learned and apply it. There are puppets Conejo and Tortuga that you can make from the back of the book but we never did do that, although I think we will yet as Missy and Sep might enjoy that. They are used in songs and activities throughout the book. Personally I like us all to work together whenever possible so if you want to use Song School Spanish with a large age range I found it best to have the older children taking charge of it and going at their own pace. The three older boys enjoyed having practice on their own and could breeze through faster just learning the words and songs and writing them out. George took the initiative and started having lessons with the younger ones and that worked really well also. Classical Academic Press also has a website called Headventure Land that was created for practice and review of what has been learned. It includes videos, stories, and games. I highly recommend Song School Spanish! What a fun way to learn another language and it is so easy to use! Song School Spanish workbook is available from Classical Academic Press for $24.95 and that includes the "lively musical" CD. The nice thing about the workbook is that the child can do the copy work on the pages and lines designated for it. But if you have more children they could easily copy it onto lined paper. There are sample songs and chapters available for you. I did receive the Teacher's Edition which is also available for $24.95. This book contains all of the pages that are in the student edition just smaller. It also has helpful hints in teaching and has additional activities and worksheets for those who are ready for more study. Find out what the rest of the Crew thought of Song School Spanish... Adios! Disclaimer: I received a copy of this product through the Schoolhouse Review Crew in exchange for my honest opinion. I was not required to write a positive review nor was I compensated in any other way. All opinions expressed are my own or those of my family. I am disclosing this in accordance with FTC regulations. Hola! Yo me llamo Karen. Como estas? I love your greeting at the beginning of the review, what a great introduction to the curriculum. Lovely review! I would recommend using the puppets, my girls LOVE them. I actually glued them to cardstock and covered them in clear contact paper. We use them every day. I'll have to check that out for next year's curriculum.